The hotel lawyers of JMBM’s Global Hospitality Group® are frequently called upon by the organizers of hospitality industry conferences to speak on critical issues affecting hotel owners, investors and lenders. 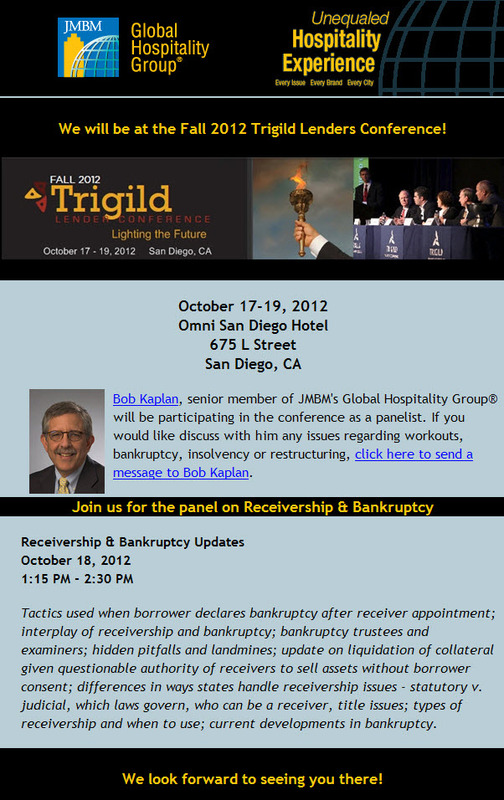 My partner, Bob Kaplan, will be speaking this week at the Fall 2012 Trigild Lender Conference in San Diego. Hotel restructuring, workouts, receiverships and bankruptcy. The art of heavy lifting. Because bankruptcy lawyers tend to stay out of the limelight, we were pleased when my partner, Bob Kaplan — a superb bankruptcy lawyer and a senior member of the Global Hospitality Group® — was featured in the recent Northern California Super Lawyers® Magazine. Bob is the kind of lawyer who gets the best results for his clients in the least possible time, and he is not the kind of lawyer to toot his own horn. However, the work he does for our clients is critical to their success, and the expertise he brings to a troubled hotel can add significant value for all players. For a glimpse into the high stakes work of commercial bankruptcies, please read this article about a great partner and friend, Bob Kaplan. It describes what we do best at the Firm — take care of clients and deliver results. Hotel Lawyer with the latest information on hotel loan defaults, foreclosures, forebearances and distressed sales in California from the Atlas Hospitality Group. Less than two weeks after the quarter’s end, Atlas Hospitality has released its California Distressed Hotels Survey (2nd Quarter 2010). Here is our executive summary of that report, our view of its national implications and what we think it means for owners, lenders and investors. Hotel workouts, hotel bankruptcies, hotel receiverships — We wrote the book on troubled hotel assets: The Lenders Handbook for Troubled Hotels. Lenders, special servicers, investors and receivers! Are you aware of the full range of alternative strategies for dealing with troubled hotels? Does your lawyer provide you with analytical tools to help you identify, evaluate and select from a full range of options? Do you know how to recognize the crucial points where the wrong decision can give away more than half the value of a hotel? We cover these critical issues — and much more — in our new, comprehensive, 98-page book, The Lenders Handbook for Troubled Hotels. Distilled from experts who have more than 1,000 bankruptcies, receiverships and workouts under their belts and more than 20 years of experience, you will find the handbook useful as a permanent resource that you can refer to time and again. CMBS loan delinquencies — a problem growing every month at a staggering rate. According to the Monthly Delinquency Report issued by Realpoint a few days ago, the total outstanding amount of CMBS (Commercial Mortgage Backed Securities) tracked by that firm is almost $800 billion, of which approximately $46 billion was delinquent in January 2010. Hotel Lawyer: California foreclosure traps for unwary lenders: California’s one action and anti-deficiency rules. What one top expert tells lenders about avoiding the pitfalls of foreclosing in California on hotels and other mixed collateral. Hotel Lawyer with tips for lenders on defaulted California mortgages. California now leads the nation in defaulted mortgages for hotels and commercial real estate. As lenders start to review their options, they must formulate asset plans that will avoid violating California’s tricky one action and anti-deficiency rules, or they may be in for some nasty surprises. Hotel Lawyers with grim reports from the field. If lenders are looking for some encouraging news on their distressed hotel asset sales prospects, they are not going to get it anytime soon. That is what the Atlas 2009 Year End Hotel Survey shows, but it does offer some valuable tips for dealing with continued distress in 2010. Here is an executive summary.